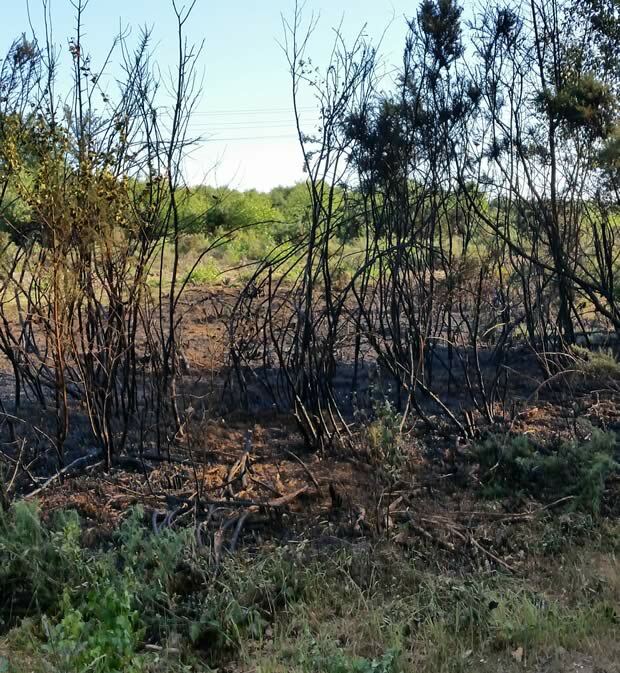 An area equal to the size of six football pitches was destroyed in a wildfire on YateleyCommon on Sunday (July 19) evening, Hampshire Fire and Rescue Service has confirmed. 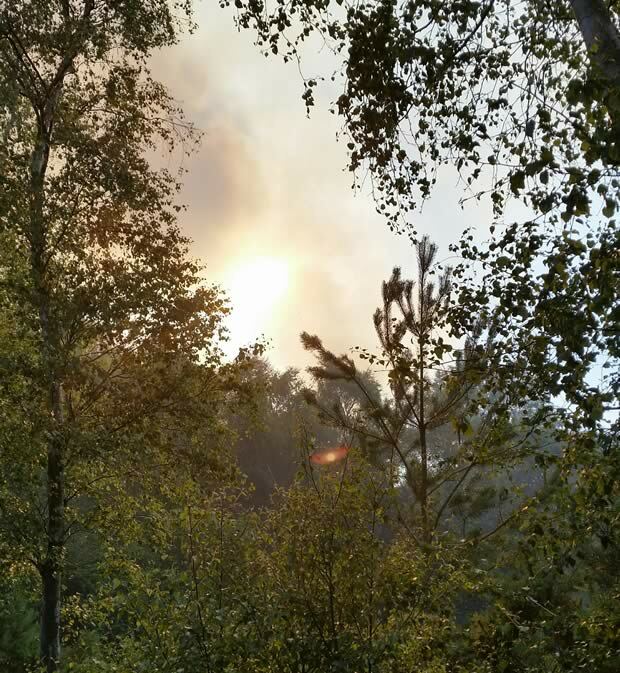 Crews from Alton, Camberley and Hartley Wintney were called in to help those from Yateley Fire Station after receiving their first call to tackle the wildfires on the common at 5.45pm on Sunday evening. Three fire engines and three Land Rovers were used to stop the fire spreading beyond the six hectares of gorse and undergrowth it had already claimed, using hoses and beaters to surround the fire completely. Fire services left the scene at 10pm last night when they were happy the fire would not restart again, with two vehicles returning this morning, spending a further three hours hosing areas deemed 'hotspots' by Hampshire Fire and Rescue. 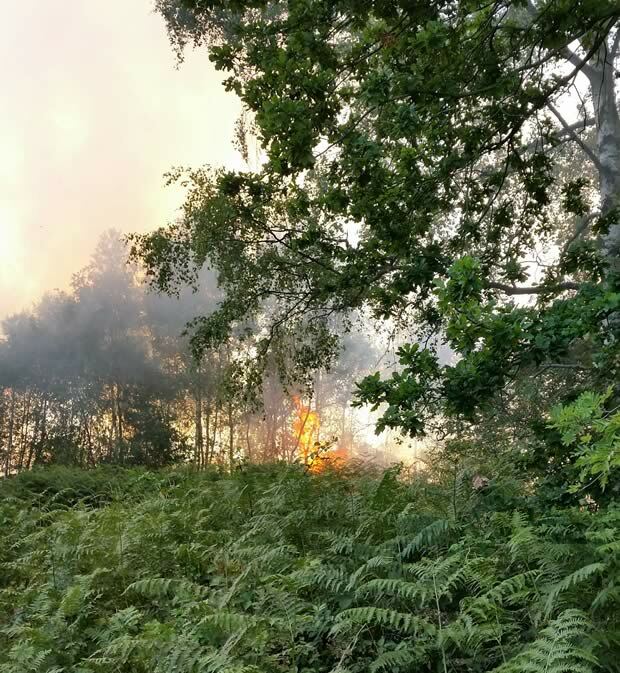 Station Manager Alec Martin, officer in charge for the Yateley Common fire, said: "The fire on Sunday sadly destroyed a huge area of the common, which is a vital natural habitat for so many plants and animals. 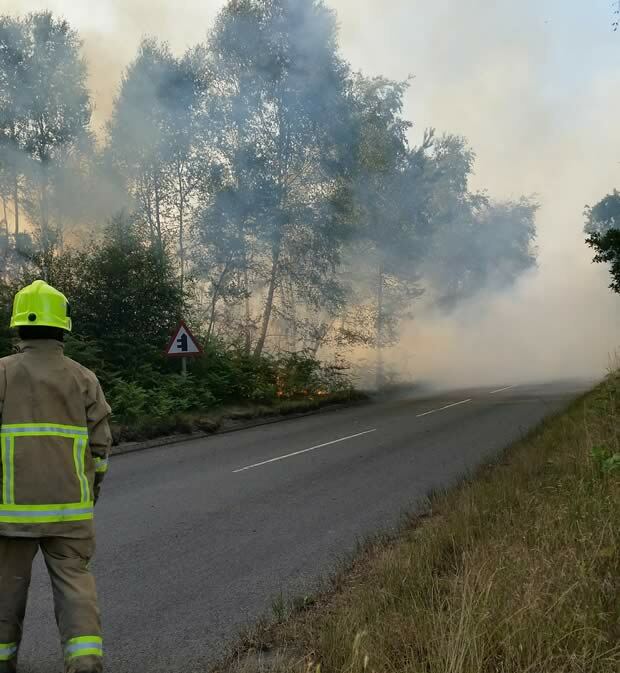 "It wasn't the only significant wildfire in Hampshire over the weekend and as the weather remains dry and warm, the risk of further fires will increase. "Fires like this can be started from a carelessly discarded cigarette, broken glass magnifying the sun or barbecues left unattended, so we urge people to take care when they are out enjoying the sunshine." It was not the first fire to have occurred at the common this year. Firefighters were called there as recently as June 6, when they tackled two fires on the same day . Anyone who sees someone who appears to be deliberately starting a fire should call 999 or Crimestoppers on 0800 555111. "The common should be mown after breeding and seeding has been completed"
Devastating news on the fire at Yateley, how it started goodness knows, may I make a suggestion? HCC have no intention of making any application to PINS or refusing to acknowledge the application by YCA, HWT as a charity cannot, the application made by Yateley Commons Association (YCA) stands, but only for reference purpose only, no different to any other application, this then gives YCA a strong argument against proposals and arguments in favor of acts of security, that is until title deeds to predate 1189 are produced. There are commoners with rights on this common, they, have obligations to keep the common in condition to be able to graze and take winter fodder, meaning the land may be mown and the herbage stored. Peter the commoner got upset when I pointed this out to him, but commoners are obligated subject to their rights, commoners are not owners but are confirmed on a register for the product, my suggestion is that he and other should be approached to have the common mown after breeding and seeding has been completed either by YCA or themselves, once the hot weather is upon us the herbage will be gone and prevent fire destruction, I am convinced that the fire service will support you in this as they have over the fencing, the works will be lawful.